Thanks to all who stopped by for the Operation Write Home Blog Hop. Now that is just the kind of set I've been looking for! Lovely work on your blog - it was a pleasure ot visit! 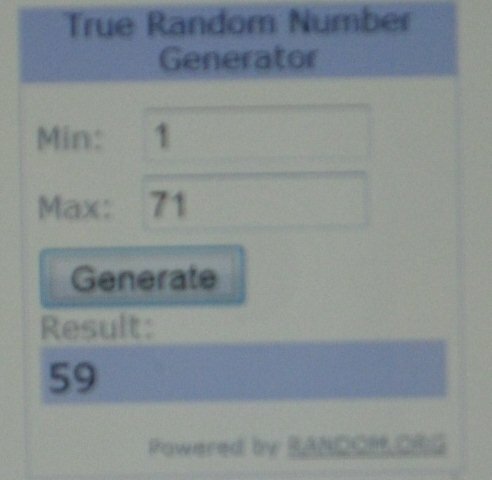 Candy closed at 6PM, so entries posted after that are not included in the candy drawing, but still very appreciated. Thanks for those of you who also chose to follow my blog- I hope to see you over at OWH with the Sketch challenges! Operation Write Home Blog Hop plus Candy! Operation Write Home is a project of Volunteers that make cards and donate time and talent to send cards to the troops. I am participating in a Blog Hop this weekend to support the soldiers that choose to do what they do so I can live comfortably in America-Home of the Free and Land of the Brave!!! I am also very appreciative of the families of the soldiers- they are blessed and proud, but I am sure there is alot of praying going on in their homes! Sit back and grab a cup of tea or coffee and join in on some Red/White/Blue fun-the Hop officially starts at 10AM! There about 135 stops as of Thursday! I started sending boxes to the soldiers about 5 years ago and recently found this great organization with a group not too far away from my home. The cards that are sent to the soldiers can not have any glitter on them at all- so I used my sewing machine and some metallic thread to add some sparkle! I used the sketch from MoJo Monday to put the card together. The background red panel is ‘sanded coordinations’ and the white is cuttlebug highlights. The stamps by Firecracker Designs by Pamela are perfect for soldier cards- and you can WIN a set just by commenting on this post. You do not have to become a follower to win, but you must come back and drop me a line to claim your prize within 48 hours of the end of the hop. (Winner can e-mail me at Shellymc2 at Comcast dot net). If you are so inspired to make a red/white/blue card, you can link up to the OWH blog which is the last stop on the tour. This week for Bloggers Challenge, I went all Patriotic- since I have this awesome stamp set by Artistic Outpost that I do not use enough! I used Technique Junkies Sanded Coordinations (red) and Cuttlebug Highlights (white) for the background. I stamped the image and sentiment in SU Night of Navy. I added a few red stars on the sentiment panel. That is my Dad in Korea. He was probably pulling a practical joke on someone……! Thanks for stopping by today- I hope to see you Saturday for the Operation Write Home Stars and Stripes Blog Hop- I will have some non-fattening candy! Also, the Belli challenge is about using you OLD supplies- put away and not used in a while! (What’s in the back of your closet???). If you create a card- go to the Belli Blog and link with Mr Linky to join in the fun-we’d love to have you join us! I put my brayer away last August, and have not used it until last weekend-I attended a Michelle Zindorf seminar. I took the Beginner and the Advanced classes (again!). I had a great time and looks like I learned……something! I used Soft Sky, Baja Breeze and Not Quite Navy on this card for the brayering. The accent greenery is embossed with Old Olive on the top and colored in with Old Olive and Almost Artichoke on the top, and for the reflection, Certainly Celery and Old Olive. To complete the sketch and embellishment, I added piercing along the edges- I used 1/2 of a 1 3/4 inch circle punch for the moon and for the borders. On the top, I made it a double row. I took some ancient white fibers (remember that craze- what 5 years ago??? ), and dragged it through the Baja Breeze ink pad, then went through the top holes of the piercing with a Tapestry needle. To complete the card, I added white gel pen highlights. Here is the link to the Belli Challenge Blog- please check out the DT samples and link up your card when you create one- you have two weeks to create, and we would love to have you join us! 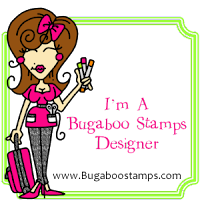 Every Wednesday- Wacky Wednesday that is, Pamela at Firecracker Designs puts one stamp set on sale 50% off. This week, the sale set is Scatter Joy- regularly $12.99- today Wednesday 12:01AM to 12 midnight tomorrow night-HALF PRICE-no coupon is needed-the sale price will be noted as such in the FCD store. I used a Technique Junkies background called Glimmer Mist Watercolors. I cut out the medium flower, omitting a few of the petals on the yellow flowers, colored them with Copics and added Shimmerz (from FCD) and clear beads to the flower centers. I also used the SCS sketch challenge for this week- the middle layer I made with my sewing machine-can you see the stitching that boxes the flowers??? Next , I made a faux Crayon resist- highlighting with a white gel pen instead of using the crayon. I daubered Orchid, Gable Green and Turquoise inks on Glossy CS. I used random.org for the Blog Candy winner from my FCD Blog Hop post. #14 is Carrie! Congrats Carrie- please send my your address, and if you want me to trim/cut out the stamps prior to mailing them. Thanks again to everyone that posted for my Blog Hop candy! I made some ATC’s today for the TJ swap with a background called Metallic Parchment. I used different colors on the backgrounds and there is a touch of silver in the technique that does not show up well in the photograph. The fairie is stamped in black on vellum and torn- I used Vellum so you can see the background. (From Studio G). All of these Techniques were tutorials in the Technique Junkies Newsletter. For our Bloggers Challenge this week, Lisa gave us a sketch challenge. I had some fun making Technique Junkies backgrounds last week- called Metallic Parchment. I intended this to be used for a soldier card, but it screamed FLOWERS to me today! SO……. The base is Kraft spritzed with Glimmer Mist. Next, is the Metallic Parchment- it is olive green and Carmel in color with Gold highlights. The main panel is stamped with Old Olive, Apricot and Pumpkin markers and the floral image. The edges are pierced and gold ribbon added. There is a metallic gold piece behind the floral panel. The final accent is a dragonfly brad from Markies Finer Papers- they have awesome brads and charms. Three Pumpkin colored Dew drops finish the card. Thanks for stopping by today- great sketch Lisa! The Firecracker Designs by Pamela design team has been challenged to use ‘Distressing or Grunge’ on our cards. Hmmmmmm- Technique Junkies to the rescue! First, Our Blog Hop officially begins Friday AM at 8:00AM, so if you arrive early, all of the links may not be up and running yet. The Hop is ‘circular', so you keep hopping until you get back to where you started. Pamela picks one mystery hostess, and IF you post a comment on each blog, you will be eligible to win CANDY! Pamela always makes all of her images in her sets work together- so my card is from: A little Birdie told me and Scatter Joy. I stamped the images and colored them with Copic markers. The ‘bricks’ are SU markers Going Gray, Basic Gray and Black. I used Ranger Distress inks Tattered Rose and Fired brick for distressing and flowers. I used Copic markers R20 and R24 for the flowers and the flower embellishment. The bird house is E31, E33, E34, E35. The DSP is Porcelain by Basic Grey- my colors- Love this DSP!!! I distressed the edges of the background cardstock, and around the main image, used a TJ technique called Torn Frames. The blog hop winner will be announced on Pamela's Blog Monday after 8PM. I am also offering candy- Pamela has a set 50% off each Wednesday- did you miss the set this past week? It was Oops a Daisy- I like it so much, I bought two! To win, just post a comment on my blog hop post by Monday at 8PM. Please leave an e-mail address- or a way for me to contact you! I will even cut it for you if you would like that! One more thing- FCD has gone Digital! Pamela has a call out for a digital design team! HERE is the link with all of that information! We'd love to have you join us! Don't want the committment of a Design Team but would like to be a digi guest designer? Just drop us a line on the above link to Pamela's Blog. For our Creative Inspirations challenge this week, our challenge was 3-D. I took the opportunity to make my first ever easel card! I had a heck of a time getting a good photo due to all of the shimmer on the card. The flowers are painted with Light Purple Creative Inspirations Paints. Other colors used: the tray-Coal, The wine/champaign glasses-W1 Copic with Angel Dust CI paint, The wine bottle is Green Olive and Buttercup CI paint- I left the label blank for the time being-but will fill it in with initials before giving it away. Pamela at Firecracker Designs has a beautiful set of Daisies that she is offering at 1/2 off ($4.49) today only-Wednesday 12 midnight to 12 midnight tonight. No code needed- when you click on the set, it will show up for this awesome low price! That is a lot of rubber for $4.49 in my opinion! I could not resist making a card with this beautiful set tonight! I used the Crushed Curry CS (I still had out for the Bloggers Challenge from Friday), and I have a new paper stack, Porcelain, from Basic Grey that is a perfect match to the Curry. I cut out a Nestability frame that I won in a Blog Candy from Becca in White CS to outline the embossed flowers. The background is also inked with Versamark and Curry with FCD German Script stamp. I could get carried away and make more....but I have to work tomorrow, so I had better call it a night! This week for our Bloggers Challenge, we are challenged to use Taken with Teal, Crushed Curry and Real Red together-now that was a challenge- I like the end result- what do you think? I started with a FREE digital image-available this week at Firecracker Designs by Pamela-this is the LINK (free until next Saturday), and used the sketch challenge Pamela has on her blog with the freebie. I colored it with Copic markers that best matched the SU cardstock colors with added green for the grass and gray for the rocks. (I will edit and add the colors tomorrow night). The grass is stamped with the little haystack stamp in the Pitchin In set by FCD in Old Olive and Kiwi Kiss. I used Sanded coordinations on a piece of white core CS that matched the Teal beautifully, added a sentiment, flowers-sponged with Curry with red brads for the centers. The butterfly has a touch of Atyou Spica pen by Copic- I love the shimmer! I am going to mail this card to my Mother- she is a wonderful gardener and I always think of her when I see beautiful gardens or floral images. To see other Bloggers Challenge players color challenge cards, click HERE. Firecracker Designs is having a Digital Design Team call out now through the 25th- Here is the link for more information. On the butterfly, I used Y11, and touched R39 to the edge of the CD- the marker was so wet with ink, the ink wicked into the wings…….never had that happen before…..! I put a little E35 in the center after using ‘O’ to try to remove some of the burgandy. No glitter or sparkly is allowed for the soldiers, so I stopped here. I added the Wisped Frame from Technique Junkies and also added a distressed torn frame to accent the main image. Again I used the Nouveau Chic DSp from Su- which I have had just shy of a year and have not touched until now. Again- no glitter or glitz for the soldiers, so I stopped- I decided to make it a no lump-no bump card for the soldier to mail home to his mother. This is my second post today- my first post and the FCD sale for Wacky Wednesday is HERE. This week we are excited to have Sew Many Cards sponsoring the Belli Challenge! We had so much fun playing with the Digital images available at their store! This next week one lucky winner will have the chance to WIN their choice of 5 digital images! So much fun!!! Now onto challenge #91 - HOLE PUNCHES - You can fill your punched holes with brads or eyelets or just use your paper piercer!!! Remember grab something that is OLD and FORGOTTEN from your stash! The Belli Challenge is all about using up your OLD STUFF and FORGOTTEN TREASURES!!!! For the challenge, I used a little girl playing dress-up. I colored her with Copic markers, and used a Technique Junkies background called Glimmer Mist Watercolors. 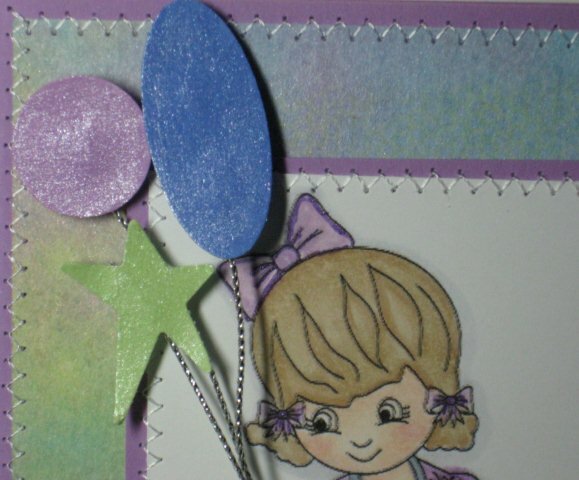 I added punches for the balloons and colored over the plain cardstock with Creative Inspirations Paint to add glimmer. I also outlined the bow and the stitches on the patches with a purple Copic Atyou Spica pen-love the beautiful sparkle! 2. Make a completed project/card with anything with a Hole Punch! Grab something you have had lying around for ages! It could be ANY THING, just add your hole punch and create! 3. Share the link here in the comments linking to Mr. Linky - CBC91. 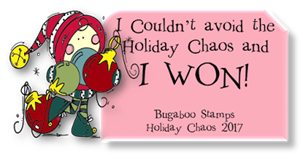 When you post to Splitcoaststampers or to your blog, be sure and put CBC91 as the KEYWORD and mention of the challenge - with a link! NOTE: IF YOU DO NOT MENTION THE BELLI CHALLENGE, YOU WILL NOT BE ELIGIBLE TO WIN! You have two weeks to play in the Creative Belli Blog Challenge- so pull out something you have not used in a while-for me-the punches- and go on over to the Creative Belli Blog and join in the challenge! I do not get a chance to do the sketch challenge at SCS anymore, so jumped at the chance tonight! This follows the sketch- and we were told the angled piece had to be square. I used Basic Grey DSP and SU Baja Breeze and White CS- did a little stitching and there you have it! The image is colored with Copic markers. Ribbon from Target $1.00 spot. This set, normally $8.99 is 50% off today Wednesday only at Firecracker Designs by Pamela-so $4.49 today only! My daughter is in college, and her sorority mascot is an owl, so I send alot of owl themed cards. A Horse is a horse of course, of course…….. I made a background from the Technique Junkies-an oldie- called Bandana. I used Ranger distress inks and a white gel pen for the technique. Next, I layered the background on Kraft cardstock. The image is stamped in Close to Cocoa dye ink then into the Versamark pad, and then clear embossed. I colored over the horse with Copic markers E31, E33, E35, E37. I sponged and pierced the edges. I added a touch of W3 for a shadow below the horse. I made this for a blogging sister that went to the Kentucky Derby recently. Our Bloggers challenge this week is a Mother’s Day card OR a card for a Friend. Since my Mom lives in Ky, I mailed her card a few days ago, so I made a card for a good friend. My friend is celebrating her 25th Wedding Anniversary in 2 weeks, so I made her card for this challenge. I had fun making flowers today with my friend Nancy- I see them all over blog land lately. I wanted to try a rose out of heart shapes- I found a tutorial HERE. I altered the tutorial a tiny bit so I could use my heart shaped Nestabilities (edit to add- I did have to trim down the nestability hearts 1st and 3rd layers). 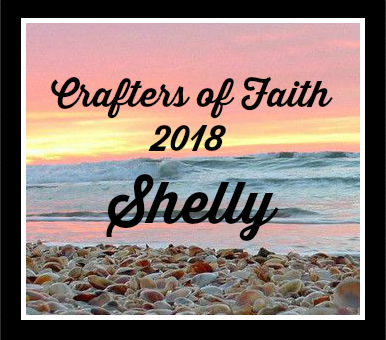 (Gabi was our Guest designer at Firecracker Designs by Pamela last month- she does beautiful scrapbook pages –if you have a little time-check out her blog HERE). It was more time consuming for me than I expected, but that is OK, I wanted to try something different. I spritzed the card background and the flowers with Glimmer Mist. I added leaves from the SU bird punch from SU in Almost Artichoke. The pink is Rose Romance- my all time favorite cardstock color. I added White Gel pen around the edges of the frame, and used Whisped Frames by the Technique Junkies to finish off the card. Here is a link to the other Bloggers Challenge players who made Mother’s Day cards or cards for a girlfriend this week. Thanks for stopping by! Icing- a yummy (usually sugary) topping applied to the top of something yummy to add further calories further enhance the flavor of the already yummy treat! The stamps are from Firecracker Designs by Pamela and are colored with Copic markers E31,E33,E35,E37,R81,R83,R85. I applied TuTu Pink Creative Inspirations Paint over the top- note how you can still see the shading from the Copic markers through the CI paints. I had so much fun, I decided to make a second card with the CI paints……I have alot of birthday cards to make in May…….so I went to town….. This card was alot of fun- I got into my old stash of Technique Junkies backgrounds- and picked this Gesso Chic from Dec 06/Jan07 and added CB Highlights. I used a digital image from CocoDingo. I colored with Copics and painted over it all with Angel wings Creative Inspirations Paints. My brother plays the bass guitar, so I decided to send this to him for his birthday next Monday. I hope you will stop by the Creative Inspirations blog to see what the Dt has created with the Icing theme today! Love bites is the name of the set. 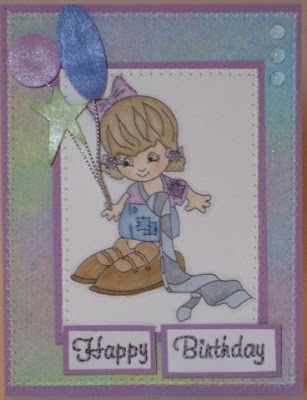 Samples using the card today can be found on Pamela’s Blog HERE and Karyn’s blog HERE. There are additional cards in the gallery. After my birthday- when my blogging friends showered me with cards- I decided I had better get with it and make some birthday cards to share- it was so much fun to get snail mail!!! I have a few Birthdays in May, so here is just one…... The image is from a Grab Bag I purchased from I Brake for Stamps. I stamped it in black ink on a background done with Spray Starch and Pearl Ex (micro pearl)-the technique is from the Technique Junkies newsletter. I layered it on a panel of Cuttlebug Highlights-also a TJ technique. I decided to just add a touch of ribbon with a clip- easy to mail hopefully- not too lumpy and bumpy! The Technique Junkies group has a perpetual ATC swap hosted by the talented Juliet. Anytime I can manage to make 5 or 10 ATC’s, I mail a grouping to Juliet, and in return, I receive the same number I send to her (sometimes I send random numbers and she sends me back whatever I send her…). It is a wonderful way to visually see and touch techniques I have not had a chance to try, and to have samples of other talented artists work in hand. Juliet also makes cards to send the ATC’s in- and this time, she sent me a Birthday Card-Thank You Juliet. I love your card- you are so nice! Pamela at Firecracker Designs by Pamela will be adding a Digital Design Team and is having a call out for ONE WEEK to fill the call Now through May 10th. I hope you will consider joining us at FCD for a Six month term. We are also looking for Guest Digital Designers beginning in June- contact us at the address listed in the above application if you are interested in doing a one month Guest Designer term. You do not have to use a FCD image to apply- we'd love to hear from you!